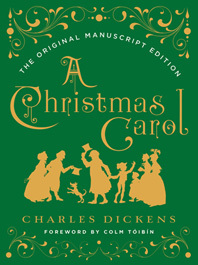 A Christmas Carol: The Original Manuscript Edition - Description | W. W. Norton & Company Ltd.
Every Christmas, the Morgan Library & Museum in Manhattan displays one of the crown jewels of its extraordinary collection: the original manuscript of Charles Dickens’ A Christmas Carol with its detailed emendations, deletions and insertions in Dickens’ hand. Here, for the first time in a beautiful trade edition, is a facsimile of that invaluable manuscript, along with a typeset version of the story, a fascinating introduction by the Morgan’s chief literary curator on the history of the story and a new foreword by Colm Tóibín celebrating its timeless appeal. To celebrate her biography of Constance Fenimore Woolson, Anne Boyd Rioux has selected the best of this classic writer’s stories.